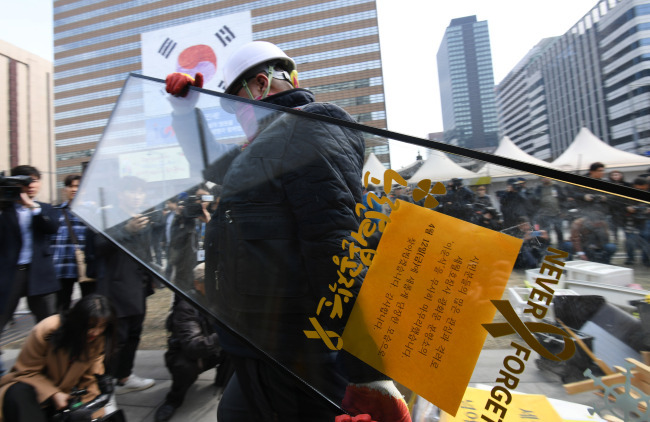 The previous day, the group of the victims' families moved the portraits of the 289 victims from the altar, temporarily, to the underground library of the Seoul City Hall as the final site for them has yet to be decided upon. Instead, a 79.98-square-meter facility, dubbed "Exhibition Space for Memory and Safety," will be newly set up on the place where the altar was located. The facility is scheduled to open on April 16, the fifth anniversary of the tragic accident, in which the 6,800-ton Sewol ferry sank in waters off the country's southwest coast, claiming the lives of 304 people, most of them high school students on a school excursion.